A youth who was receiving treatment for serious injuries sustained after falling from the top floor of a building during a clash in Embilipitiya on early Tuesday morning, succumbed to his injuries on Thursday (Jan 7th). Locals in the area who were outraged by the death of the youth, protested against the police by closing down all shops in the Embilipitiya town and engaging in a demonstration. 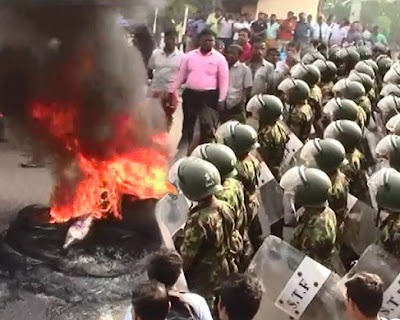 The demonstrators marched to the Embilipitiya town and obstructed the Embilipitiya – Colombo main road. The Police Special Task Force was dispatched to maintain security in the area. The clash which led to the death of the youth, broke out during a party at a residence in Embilipitiya. The incident also left four police officers and three other civilians injured. Relatives of the victim say that the Police should be held responsible for his death. The victim has been identified as 29 year old Sumith Prasanna, a father of one. Relatives of the victim say that the police had arrived at the party in response to a report that loudspeakers used at the party did not have proper authorization. They claim that the police officers requested alcohol inorder to look the other-way. Relatives of the deceased charge that the police assaulted them when they informed that they had run out of alcohol. While rejecting these claims, the Police state that the clash broke out when the Police had intervened to control a tense situation. Speaking to the media Police Media Spokesperson ASP Ruwan Gunesekera said that an ASP had received a phone call stating that there is a loud noise being reported from the party and that the neighbors were severely inconvenienced. The Embilipitiya Police was then informed to immediately report to the location and look into the matter. ASP Gunasekara went onto say that four police officers responded to the report and that a group of individuals at the party had dragged the four police officers to the top floors of the buildings and assaulted them adding that though the Police officers had firearms they weren’t used. However Police Media Spokesperson noted that an investigation will be conducted into the incident under the supervision of Ratnapura Superintendent of Police. Meanwhile in the latest developments 21 Police officers of the Embilipitiya Police including its HQI have been transferred. Police Media Spokesperson ASP Ruwan Gunesekera said that they were transferred on a temporary basis as an investigation into the death of the youth is underway. The transfers have been made to the Seethawaka and Kegalle Police Divisions.